By Phil Klotzbach, lead author of the Colorado State University (CSU) hurricane forecasting team, and I.I.I. non-resident scholar. 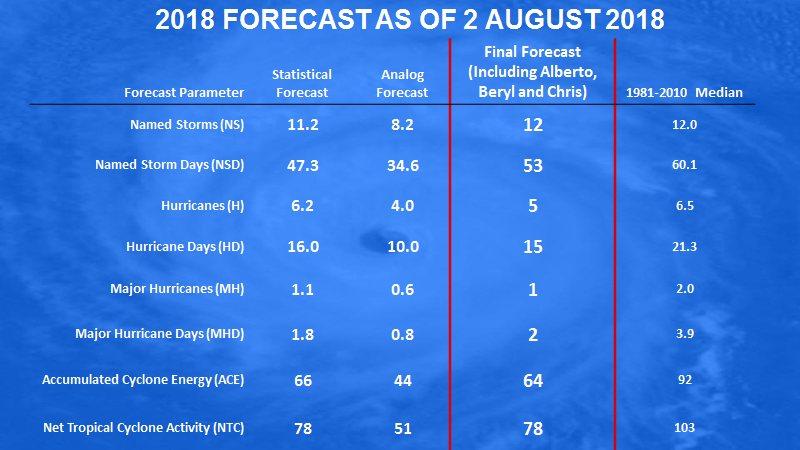 Colorado State University (CSU) updated its outlook for the 2018 Atlantic hurricane season today, and they continue to call for a below-normal season with a total of 12 named storms (including Alberto, Beryl and Chris), 5 hurricanes (including Beryl and Chris) and 1 major hurricane (maximum sustained winds of 111 miles per hour or greater; Category 3-5 on the Saffir-Simpson Wind Scale) (Figure 1). This prediction is similar to their early July forecast and is a considerable reduction from their earlier April and June outlooks which called for 14 named storms, 7 hurricanes, and 3 major hurricanes and 14 named storms, 6 hurricanes and 2 major hurricanes, respectively. Accumulated Cyclone Energy (ACE) and Net Tropical Cyclone (NTC) activity are integrated metrics that take into account the frequency, intensity and duration of storms. Figure 1: August 2, 2018 outlook for the upcoming Atlantic hurricane season. CSU uses a statistical model as one of its primary outlook tools. The statistical model uses historical oceanic and atmospheric data to find predictors that worked well at forecasting prior year’s hurricane activity and has shown considerable skill based on data back to 1979 (Figure 2). The statistical forecast for 2018 is calling for a below-average season. 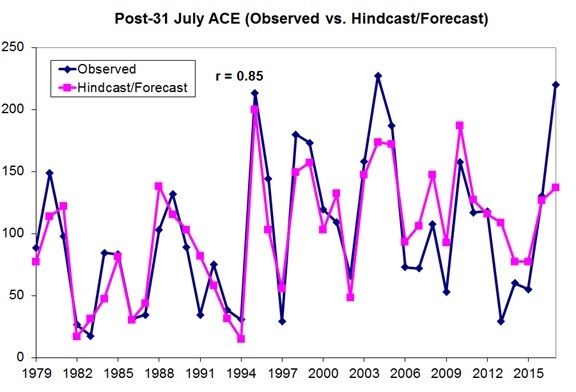 Figure 2: Skill of the July statistical forecast model at predicting historical Atlantic hurricane activity since 1982. CSU also uses an analog approach, whereby the team looks for years in the past that had conditions most similar to what they see currently and what they predict for the peak of the Atlantic hurricane season (August-October). The forecast team currently anticipates below-average sea surface temperatures (SSTs) in the tropical Atlantic and warm neutral to weak El Niño conditions in the eastern and central Pacific. The average of the five analog seasons also calls for a below-average season (Figure 3). 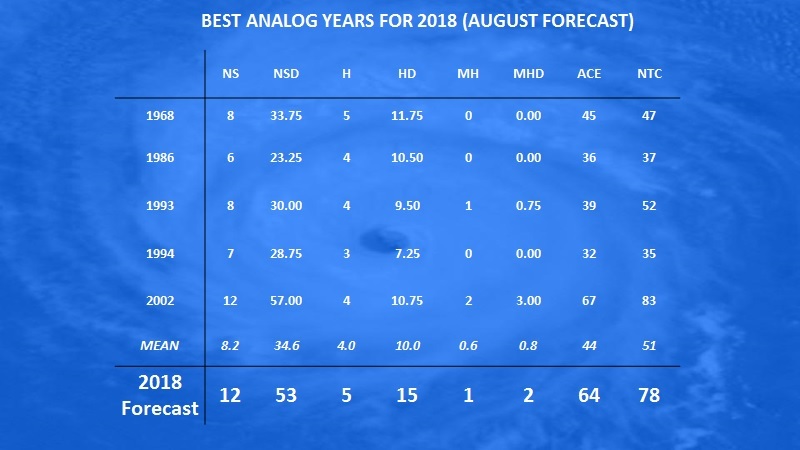 Figure 3: Analog predictors used in the August 2, 2018 seasonal forecast. The primary reason that the seasonal forecast remains below average is due to much cooler than normal waters in the eastern and central tropical Atlantic. Sea surface temperatures (Figure 4) are at their coldest levels on record (since 1982) for late July when averaged over the tropical Atlantic from 10-20°N, 60-20°W. Colder water temperatures provide less fuel for developing tropical cyclones, and they also tend to be associated with drier and more stable air, which suppresses deep thunderstorms that are the building blocks of hurricanes. This drier and more stable air has predominated over the tropical Atlantic and the Caribbean over the past several weeks. 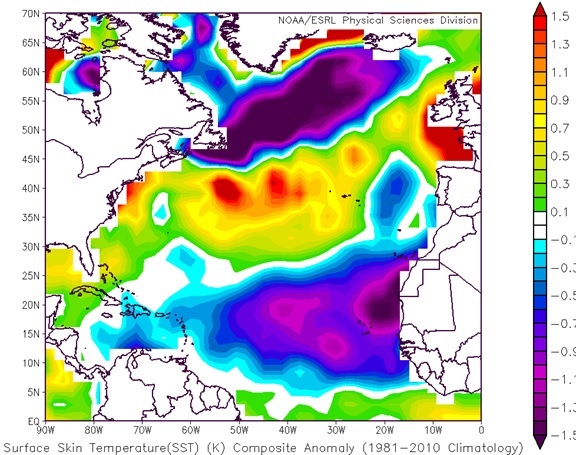 Figure 4: July-averaged SST anomalies in the North Atlantic. SSTs are much cooler than normal across the entire tropical Atlantic. CSU also believes that there is chance for a weak El Niño event developing for the peak of the Atlantic hurricane season from August-October. El Niños tend to reduce Atlantic hurricane activity through increases in upper-level winds that tear apart hurricanes as they are trying to develop. 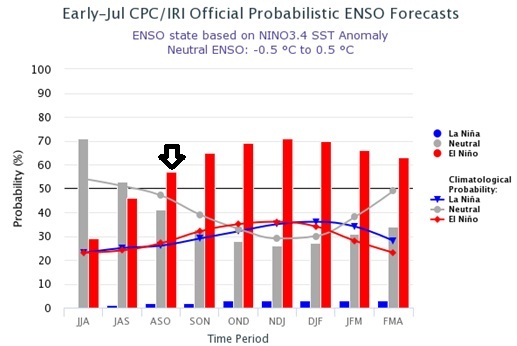 NOAA gives a slightly higher than 50% chance of El Niño development in the next few months (Figure 5). Figure 5: Official NOAA forecast for El Niño over the next several months. The black arrow highlights the August-October period, which are the peak three months of the Atlantic hurricane season historically. Figure courtesy of International Research Institute for Climate and Society. Coastal residents are reminded that regardless of any seasonal forecast, they need to prepare the same for every hurricane season, since it only takes one storm to make it an active season for you. A prime example of this is 1983. The 1983 Atlantic hurricane season had only four named storms all year, that is, we only made it to the ‘D’ storm that year. The first hurricane of that season, Alicia, was a major hurricane that caused major damage in southeast Texas.